Bohol Divers Resort is located at Barangay Tawala in Panglao town, 20 meters away from Alona Beach. The resort features above par accommodations: 12 La Residencia Houses, 12 Villa Suite Rooms, 18 Chateau Rooms and 1 Chalet House which is beachfront. It boasts of 2 swimming pools, a restaurant, beach bar, reef dive shop, outdoor games facilities and more. Amarela Beach Resort features a yellow villa with 24 rooms and suites equipped with aircon, satellite TV and internet access. This two-storey building houses antiques, local sculpture, basketry, books and paintings. The resort offers Continental, Filipino and English cuisines served by well-trained staff. Amidst trees and Bermuda grass is a swimming pool. The resort is located at Bogobo Beach, Libaong at Panglao Town. Azir’s Place is located along Doljo Beach in Panglao town, a 15 minute ride from Tagbilaran City. The place is good for 10 to 12 persons with 3 standard bedrooms and 1 attic room at the 3rd floor. All rooms have cable TV, private toilet and bath with hot and cold water, large beds and all fully air-conditioned. It has a Jacuzzi in the yard. Kitchen is fully furnished and a caretaker will be provided to serve as a personal helper. Bagobo Beach Resort & Restaurant is located directly at Bagobo Beach, Libaong at Panglao Town. The resort offers standard rooms that are either with electric fans or air-conditioners. 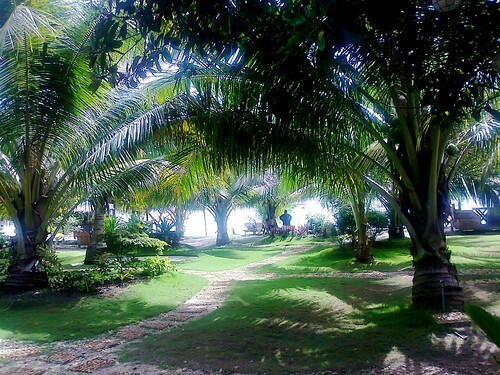 The cottages are situated amidst a well-kept garden with tall coconut palm trees and other tropical plants. Bita-ug Beach Resort offers air-conditioned native-style cottages with rooms having private toilet and bath, TV and a private entrance. The resort also boasts of a dive shop, a swimming pool, restaurant, and a fine white sandy beach. Services ranges from room service, massage, manicure and laundry. It is located at Danao Beach of barangay Danao, Panglao Town. Bohol Sea Resort lies directly on the white sandy beach of Danao at Panglao Town, Panglao Island. The resort is under German management and boast of 20 air conditioned rooms and bungalows in different categories. All rooms and bungalows are provided with toilet and bath with shower, WC, mini bar, and terrace. The resort has an open restaurant, a cocktail bar, swimming pool, a pool bar and a dive base. Coral Point Dive Resort is located at Bil-isan, Panglao Town at Panglao Island. The resort features a concrete structure housing air-conditioned rooms provided with private bathrooms and flushing toilets, hot and cold showers and two single beds. It has a restaurant and a swimming pool for confined water training, state-of-the-arts diving equipments, and a big boat. Dumaloan Beach Resort is located right on Bolod Beach at Panglao Town. The resort offers standard rooms and suites for their guests’ comfort. Facilities include swimming pool with Jacuzzi, bar and restaurant, function hall, video KTV, internet cafe, souvenir shop, games room, aqua sports and Medical Clinic. Kalipayan Beach Resort The resort’s site is big and spacious with a restaurant, a pool and diving facilities. It has about 10 cottages with a total of 18 rooms and is situated far from other hotels. Muro-Ami Seaside Resort is located directly at Doljo Beach of Panglao Town. The resort offers cheap standard room accommodations with aircon. The resort has a bar and restaurant specializing on seafood. Services include tour arrangements and roundtrip land transfers from airport-resort-airport. Palm Island Resort is situated right at the white sand beach of Doljo, near Ananyana Beach Resort and Muro-Ami Seaside Resort at barangay Doljo of Panglao Town at Panglao Island. The resort offers 15 room accommodations at the following categories: double aircon, double non-aircon, small/med/big cottages and a dormitory. Aside from other amenities, all rooms are provided with electric fans and hot and cold shower. The resort has also a restaurant serving seafood, a multi-purpose hall, a swimming pool and sports facilities. Whites and Greens Beach Resort is located in the beautiful Bolod Beach alongside Dumaluan Beach Resort and Bohol Beach Club. It doesn't offer 5-star hotel amenities however, it is still among the top places to chill and unwind for its cheap accommodations and very verdant surroundings.